Who did Jakob Chychrun inherit his competitive ways from? Not surprisingly, some of it comes from his father, Jeff, who played eight NHL seasons. But, the rookie’s mom also deserves a big share of the credit. Jeff Chychrun skated in 262 big-league games - 199 of them with the Philadelphia Flyers – patrolling the blue line with an equal measure of toughness and tenacity, racking up 744 penalty minutes along the way. There is a hint of self-deprecation, countered by an unmistakable fatherly pride, when he talks about his son, Jakob – also a defenceman – currently in his rookie NHL campaign with the Arizona Coyotes. So, too, are the reviews on Jakob, selected 16th overall by the Coyotes in 2016. Early indications point to a long career for the young blueliner, born and raised in Florida, who won the 2014 Jack Ferguson Award as the top draft pick in the Ontario Hockey League Priority Selection Draft. His first NHL game came on October 15, a 4-3 Arizona OT win against Philadelphia. At 18 years, 198 days old, Jakob became the third-youngest player to appear in a game for the Coyotes/Winnipeg Jets franchise, behind Ryan Stewart in 1985-86 and Dale Hawerchuk in 1981-82. For Jeff, who coached his son during the latter’s minor hockey days, seeing Jakob perform on the game’s biggest stage has been equal parts exciting and educational. What has he learned about NHL hockey from his son? “That’s a great question,” said Jeff. “As a dad, to be able to see the game through him, it’s been a real eye-opening experience in a lot of ways. What I’ve seen is that Jakob is really quite a student of the game. To see how professional he’s been working at his craft, especially the past three or four years, the training – it’s very impressive. That list would also include the benefits of being a multi-sport athlete, something Jakob was known for when he attended American Heritage High School, where he played baseball. 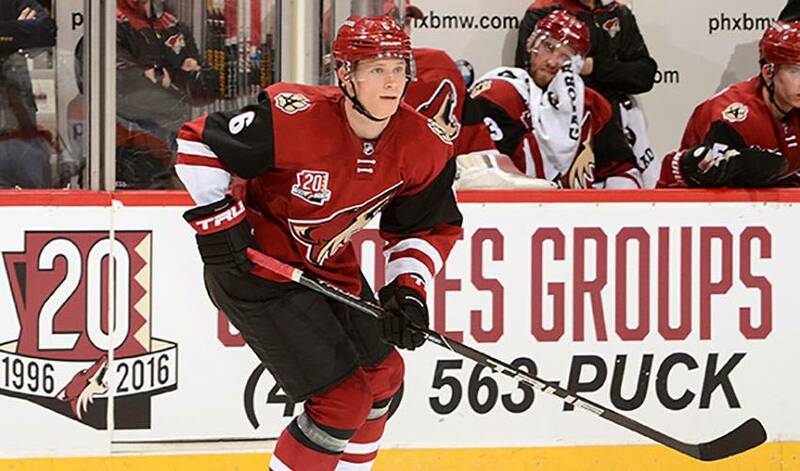 The elder Chychrun believes being a well-rounded athlete has helped the rookie big-leaguer immensely. It’s also a perfect example, offered Jeff, of his son’s unwavering commitment to hockey. And although Jakob – less than 20 games into his NHL career – has shown a penchant for being unflappable on the ice, it’s not quite as easy for his father to maintain the same demeanor watching from the seats. There are always moments throughout the course of a game, however, when Jeff is reminded of the type of person he’s watching. “He’s such a caring kid. He really likes to have a circle of friends around him. He’s very good at surrounding himself with good people and he gives of his time. He’s well-spoken and very sincere. When he speaks with someone, he looks them right in the eye and they have his attention.